Low prices. OrangeSmile.com offers car hire service in Belgium on the lowest-rate-guarantee basis, since we work with car suppliers directly. For your search criteria in Belgium, we always select and show the best rental offers. The car reservation process consists of 3 simple steps: (1) search for available cars for your dates in Belgium; (2) select your car type; and (3) fill in the booking forms. Once the reservation is completed, you will receive a confirmation voucher to your email address. During the booking process, please check your rental conditions. To pick up your car at the rental point in Belgium, you need to provide our confirmation voucher, your driving license and a valid credit card. The final payment is normally carried out at the pick-up point. Our car hire points in Belgium accept VISA, MasterCard, etc - please check your rental conditions. At the pick-up point, please read the handling manual and check the car for present defects. OrangeSmile.com wishes you a pleasant journey to Belgium! The car hire reservation system OrangeSmile.com allows renting a vehicle in Belgium within 10 minutes. Our largest database of car suppliers enables us to provide you a rental car in Belgium at the cheapest rate ever possible. At rental locations in Belgium we offer the following car sizes: mini, compact, economy, standard, premium and luxury. The following car types are available in Belgium: Sedan, Hatchback, Jeep, Cabriolet, Coupe, Minivan and Minibus. You will find many interesting places in Belgium. Nearly every town of the country is home to beautiful castles, churches and cathedrals, medieval buildings and museums. The best way to start your acquaintance with Belgium is to visit Brussels. The old part of the city is the most interesting place for tourists. Locals call old town in a very unusual way – Pentagon. The district was called this way because of numerous circle shaped boulevards that were built instead of former protective facilities. 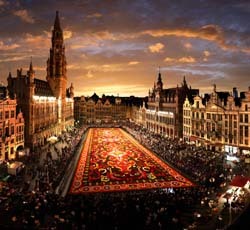 Grand Place Square is a must visit place for all tourists. The building of City Hall is also located on the square. The Museum of Brussels is located on the opposite side, and the historic district of the city starts right after the square. That place is a must visit one for tourists, as the majority of centuries old buildings, churches and squares are located there. The Royal Galleries of Saint-Hubert are one of the most famous landmarks of Brussels. This is an architectural complex that combines theatres, art galleries and museums. There are several dozen of public places there. Continue your travel in Belgium by visiting the city of Anderlecht. The most important sights of the city include the Museum of Erasmus of Rotterdam, Astrid Park, Gaasbeek Castle and Constant Vanden Stock Stadium. The city of Antwerpen is famous for its numerous museums. There are more than 30 museums in total in the city. The most famous ones are the Royal Museum of Art, Plantin Moretus Museum, Mayer Van Den Bergh Museum, the Museum of Modern Art, the Museum of National Art and Ethnography, the Museum of Sculptures and Folklore Museum. There are also architectural places of interest in Belgium, the most famous ones being Bodenbond Tower and Royal Palace built back the 18th century. The town of Lier is also worth closest attention. The most famous sights of the town are Zimmer Tower and old astronomy clock. Continue your travel, and you will reach Kalmthout Nature Reserve that is located nearby. The reserve features simply unforgettable combination of sand dunes and dense forests. Tourists, who wish to see more historic places, are welcome to visit Gent, the central part of which is a true open-air museum. Such magnificent sights as St. Bavo’s Cathedral, St. Peter’s Abbey, Van Der Meer Palace, St. Jacob Church and Royal Palace on Breydelstraat Street are definitely worth closest attention. Travellers, who enjoy going to museums, will be pleased as well as there are more than ten large museums in Gent. In Belgium, the diversity of vehicle types and price tags expands considerably when a car is to be picked-up and returned in the daytime. Travellers are recommended to ask whether it is possible to upgrade the rented car for the same money. Rental offices in Belgium often try to please their customers in case of an opportunity.